This is one of our most popular whistles! It's a Clarke Penny Whistle in the key of D (most traditional Irish music is written in the key of D or G. This whistle is easy to play in either of these keys.). This whistle is made of tin-plate, and has a wooden fipple (mouthpiece), giving it a warm, flute-like tone. Look below for the Robert Clarke story. Note that we have already "tweaked" this whistle! Clarke is an excellent whistle right out of the box, but many players prefer a whistle that requires less air, while retaining the Clarke whistle's unique quality of sound. Flatten the windway - this makes the whistle require much less air, and also softens the tone and takes away quite a bit of the "breathiness". Two brass nails are then used to hold the fipple block in place. The end of the mouthpiece is shaped for comfort, then sanded smooth. We feel that the mouthpiece is much more comfortable when it's shaped this way, and many people prefer the softer tone it produces. 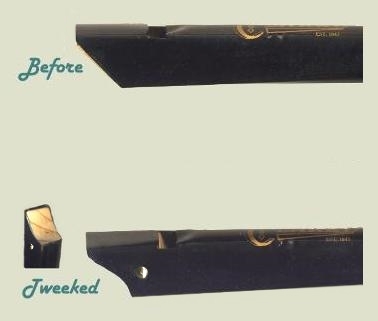 Tweaking is something that you may wish to try yourself, but we strongly discourage it if you don't have an extra whistle or two to experiment with. It is quite easy to cause irreversible damage to your whistle! If you already own one of our Tweeked Original Clarkes, then you might want to make a "Muffler" for it. This very simple to make little gizmo allows you to control the tone, volume and air requirements of your Tweeked Clarke. Due to increased demand for our Tweeked Clarkes, shipment of your order may be delayed when it includes a Tweeked Clarke Whistle. This delay should not usually exceed one week. We are currently out of stock on the Tweeked Original Clarke D in Silver (Black is in stock). Please feel free to place your order now; we will then ship it as soon as possible.